Basically, it is a concept or idea that you use while creating all your layouts to keep your monthly set-up consistent. 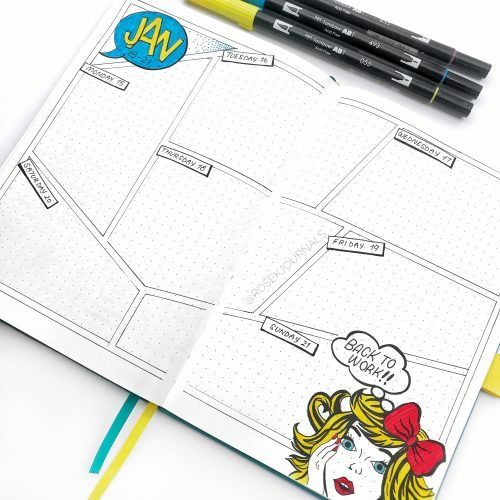 This can mean creating all your pages with the same decorations or doodles, or having slight variations on each but still tying in with the overall theme. 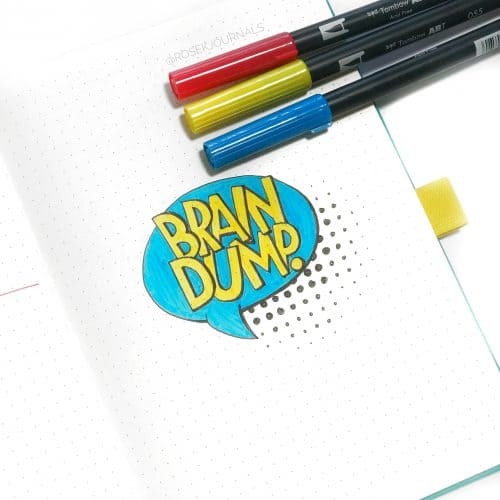 You can read more on monthly set-ups in my How to Start a Bullet Journal post. This month I decided I would choose a theme and stick to it for the whole month. 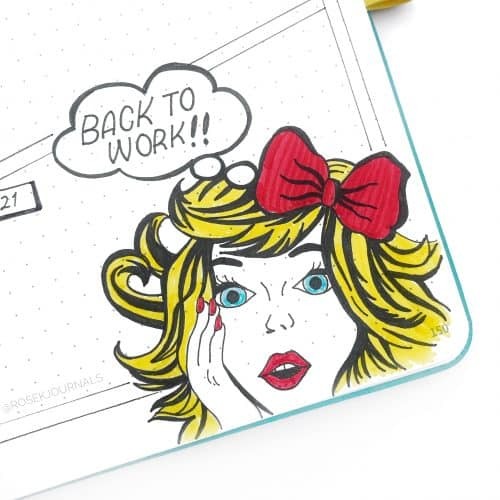 In doing so I found that you can save a lot of time and angst when it comes to preparing the following weeks spread as you already have a concept to follow. For this month I chose a pop art / comic book style theme. This theme is really easy to do as it doesn’t require neat lines or conformity, anything goes. And the bright vibrant colours add some fun into what can be a tough month for some. I created this theme using only 3 primary coloured Tombow Dual Brush Pens and a black pen. When it comes to creating a theme you can use as many or as few tools as you want. If you love the look of this theme, you can now purchase stickers from my Etsy store to recreate it yourself! You can find them HERE. 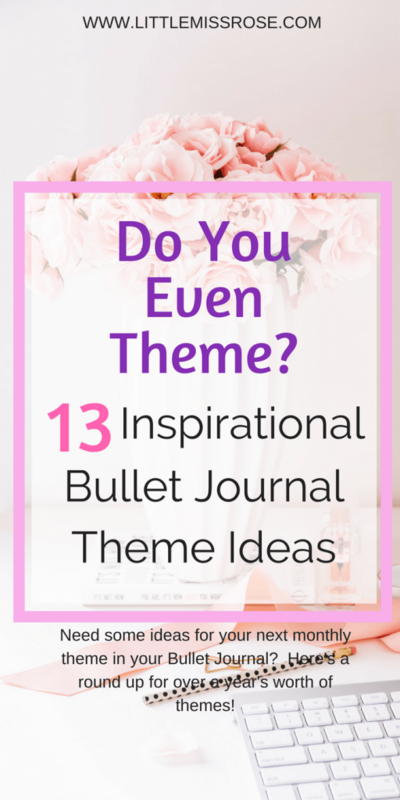 Here is a list of fun and creative themes which you can try in your bullet journal, these don’t necessarily need to be tied to a certain month, although some of course are, such as Halloween and Christmas. The simplest of themes to try! Pick a colour, any colour and use that for all your headings, drawings, or doodles. At it’s simplest form you can just use the one coloured pen, or grab a handful of shades of the same colour. 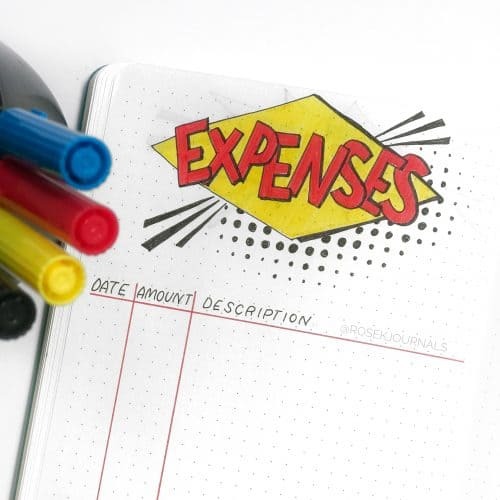 Pauline here is a master at using a splash of a single colour to add cohesion to her pages. You can view the rest of Pauline’s account on Instagram. Generally at the change of seasons you will find a corresponding change of theme, in the Southern hemisphere there will be plenty of summer themes at this time of year. Kristel in the Northern hemisphere has gone for a snowy winter theme that looks cool and crisp. Kristel’s instagram account is full of great inspiration. Florals are all the rage at the moment, especially floral line drawings where all you need is a black pen. These can look fantastic with or without colour and there is such a wide variety of flowers to choose from. Either stick to one type of flower throughout your monthly set-up or change it up on every page! The choice is endless. And this theme isn’t just for the expert artist, the most simplest of flower drawings with a touch of colour can look effective. One of my favourite Instagram account featuring florals belongs to Liz. She even had step by step tutorials so you can recreate her flowers! It's a short work week so I've condensed everything down to a #weeklyspread with a dutch door. I put my home tasks on the side you can see and my work tasks on the other. Have a wonderful week everyone! Crystals and gem stones are also very popular at the moment. 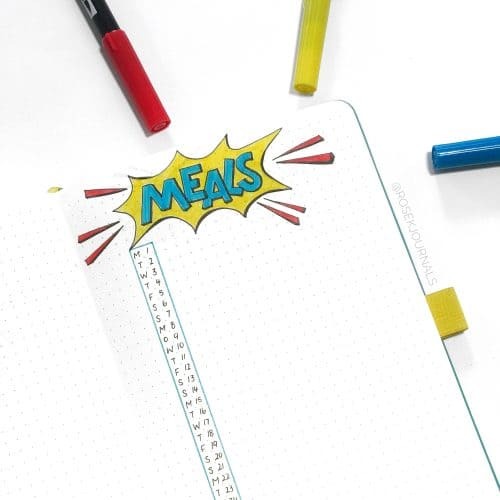 They are easy to draw and effective at adding a bit of sparkle and colour to your bullet journal. Tie this in with a colour theme and you can come up with some amazing layouts. Grandezza has used crystals and a dreamy colour theme in this weekly spread. 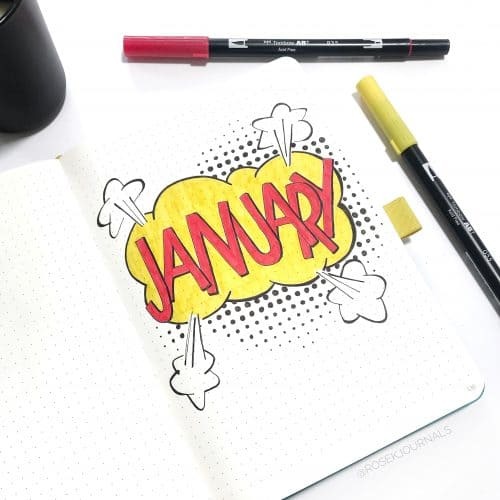 Her instagram account is full of lots of inspirational bullet journal spreads. Is green your favourite colour? Then cacti are the way to go! So easy to draw you can go detailed or simple and there is so much variety. Small or large, who doesn’t love a cactus? Sabina from thejournaltea has drawn the cutest cactus on her weekly log. Closely tied to the cactus theme are succulents. I personally find these hard to draw, but everything takes practice and once mastered they can look incredible! Succulents can have a very minimal vibe to them. Amanda created a succulent theme in her bullet journal a few months ago and even has a youtube video on how she created it. You really need to check out her account, she is the Queen of themes! Do you want something fun and colourful? Then why not fill your pages with fruit! Certain fruits can invoke certain imagery, like citrus fruits and watermelon remind me of summer. Long hot days and cool refreshing drinks! Faye has used simple watermelon doodles and corresponding colours to add a touch of cuteness to her pages. Check out Faye’s Instagram account for more inspirational spreads. If you don’t like flowers but like nature, how about leaves? 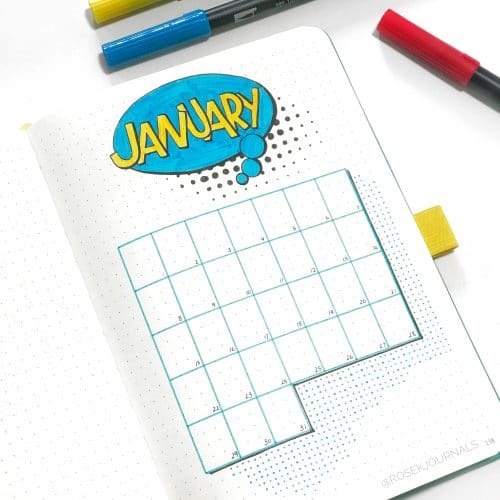 They can add a green luscious look to your bullet journal if you want to add colour, otherwise it still looks great without colour. Just look at Anne’s leafy layout here. You can check out her Instagram for more beautiful line drawings. Love the night sky? Every wonder what else it out there in the universe? A galaxy theme doesn’t have to be confined to the moon and stars. It can also include space ships, space men, planets or if you have enough art skills, the Aurora Borealis (google it). With a bit of watercolour and a white pen you can create something amazing like this spread by Alex. Alex’s account is full of beautiful artistic spreads that you must see! Everyone as a child has wanted to go to Disneyland at one time or other. We’ve either grown up with Mickey and Donald or more recently, Anna and Elsa and my personal favourite, Moana!! Kimmy has completed a full month with a disney theme, showcasing characters from some of your favourite movies. You definitely have to check out her instagram account for her amazing artistic spreads, it is a huge inspiration! Who isn’t a fan of Harry Potter? The idea of living in a world where magic exists, where you can play sports on a broomstick and keep an owl for a pet. The imagery for this theme is endless and Jannplansthings has done it so well. Go see her account for more amazing watercolour paintings in her journal. A mountain landscape brings a sense of vastness and peace and can look spectacular in your bullet journal. You can mix this up with a winter theme or a Christmas theme by drawing snowy mountains or use a simple black pen to go for a minimal look…. or not. Like Meagan’s mountains, all the line detail gives her spread a Wow! factor. Check out her Instagram account for more inspirational photos! And number 13 is Pop Art! The very one I tried in my bullet journal this month!! That’s enough themes to set you up for a whole year. But if you’re still looking for more inspiration, you can have a look at my Pinterest account for where I get my sources of inspiration from. 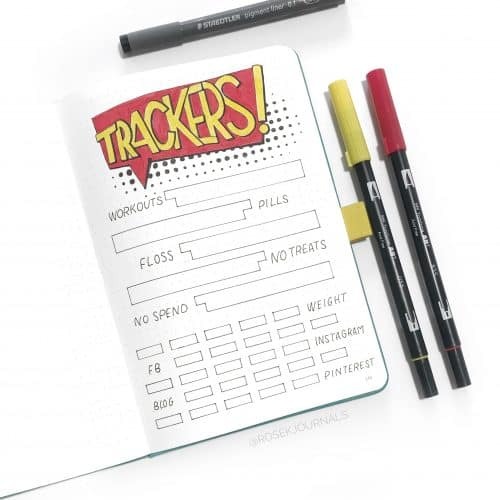 Or you can check out my Instagram account to see what I’ve personally done in my bullet journal. You can also check out who I follow for further inspiration. And remember if you want to recreate the Pop Art theme, you can purchase stickers from my Etsy shop. 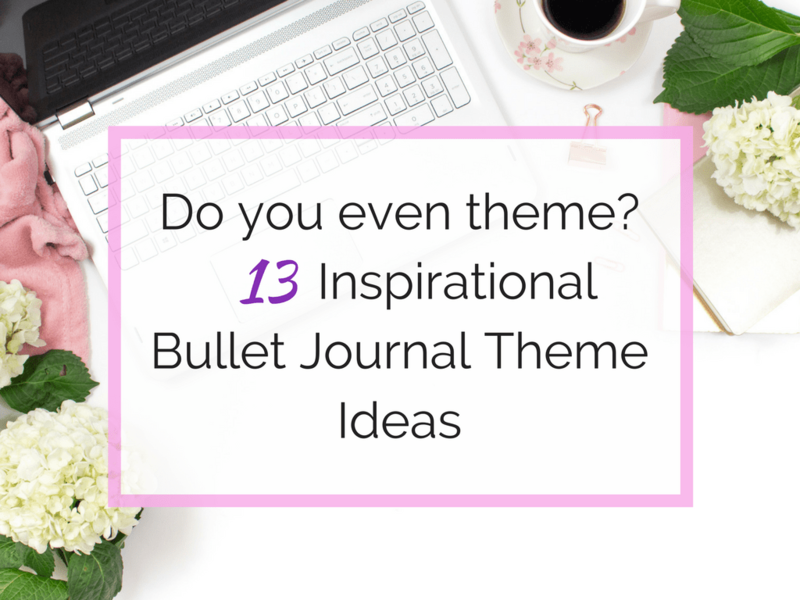 Let me know if you found this post helpful, I would love to hear your feedback and even see what sort of themes you’ve come up with in your own bullet journal! Just leave a commetn below!